Toddlers are known to be temperamental eaters. What pleases their palette one day may be a total non-starter the next. Any change in routine, minor illness, or discomfort they may experience will often lead to loss of appetite, adding to the problem. Sometimes frustration or irritability resulting from something else entirely will lead to food refusal and throwing tantrums at meal time. Toddlers and young children also will go through stages when they will want to assert their independence. One way in which they do this is by attempting to take control in different areas of their life. As there are few areas they are capable of taking control, putting their foot down over when, what, and whether to eat are normal ways toddlers try to do this. 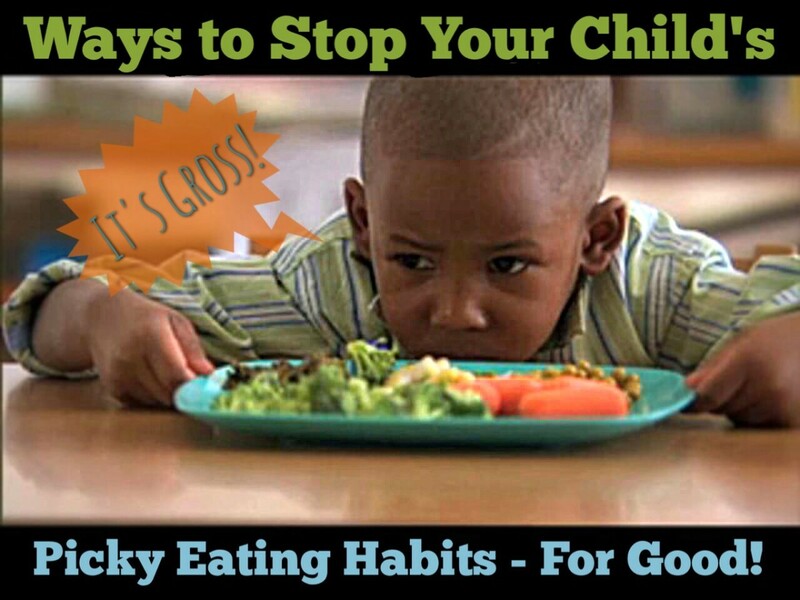 Some children may not become picky eaters until they are older, eating normally when they are a baby and toddler, then struggling with food around the time they enter elementary school. Usually, whatever the reasons children refuse to eat, the problem passes in days or perhaps weeks. Although it may return intermittently, it rarely leads to health problems, as young children don’t require as much food as parents believe. However, constantly making a battle of wills out of picky eating episodes can result in much larger problems over time. Regular mealtime power struggles can become a habit that is harder to break the longer this goes on. The information in this article is not intended or implied to be a substitute for professional medical or psychological advice, diagnosis or treatment. All content, including text, tables, and images is for general information purposes only. You are encouraged to review all information regarding any medical symptoms, conditions or treatment with your child’s pediatrician. There are a number of different terms used for children with a serious eating problem. Some of these include problem feeders and extreme picky eaters. You may also hear the terms picky eating disorder, food aversion disorder, food phobia, neophobia, and selective eating disorder among others. Whatever the term used, it is important to understand the difference between picky eating and a more serious food aversion. This is not easy as the definition and criteria for each is not always agreed upon by professionals. Overall, picky eating, though annoying and frustrating for parents, is generally thought of as part of normal child development. Selective eating or food aversion is far more serious and usually requires the help of a therapist specializing in feeding disorders to cure. Selective eating can have a serious effect on the entire family as the balance of attention shifts to focus primarily on getting the child in question to eat. General advice recommended for normal picky eating doesn’t work with more extreme feeding disorders and food aversions. This leads to even greater frustration on the part of parents, often complicated by the fear they are bad parents. They compare themselves to other parents who don’t have children with eating problems and wonder what they are doing wrong. They try new strategies and take advice from books and online websites with no result. Often the problem gets worse and the relationships between family members suffer. Other children become resentful as all the attention becomes focused on the child with the problem. Parents argue over how best to handle the problem and seem to have little interaction that does not involve the child who won’t eat. The child understands something is wrong but can’t do anything to change it and becomes upset because the rest of the family is upset. This may result in behavior problems unrelated to eating making the family atmosphere even tenser. Doctors may not be well versed in how to recognize or handle feeding issues and fail to understand the seriousness of the problem until major nutritional issues result. 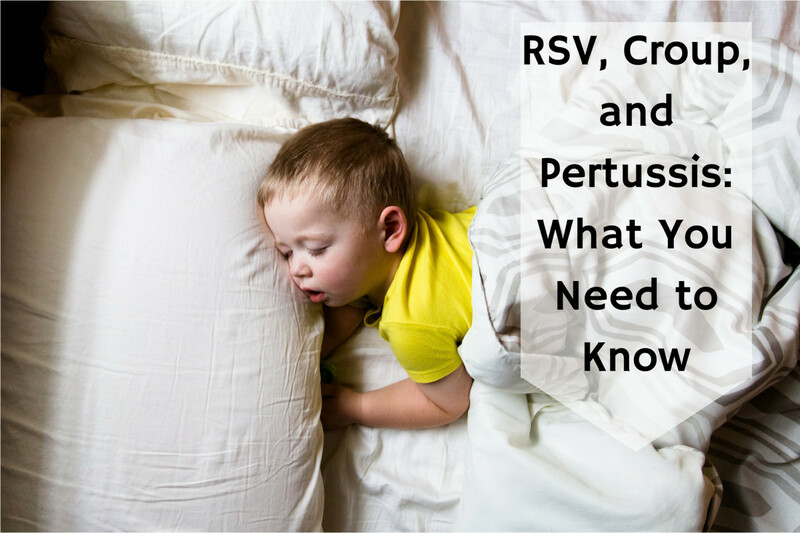 This can possibly lead to the need for extreme interventions such as a feeding tube. This creates additional difficulties as it doesn't teach new skills or address whatever the actual cause of the eating problem. In an effort to help you better understand whether your child is a normal picky eater or perhaps has a more serious problem about which you should consult a specialist, a summary of some of the main differences between the two conditions are listed below. can be coaxed to occasionally try new foods. New foods may lead to vomiting, gagging, or temper tantrums. The smell, sight, or feel of a new food may lead to a negative response. Strategies that work with picky eaters such as “try a bite” don’t work. Some of the tried and true methods of encouraging your child to eat during almost any stage of development are presented below. While all of them may not prove effective, if you stick with it, you’ll find that over time, several will help your child eat more and eat a wider variety of foods. The main key is not to get frustrated or angry. Remind yourself this is a normal stage of development which they most likely will grow out of. If the problem went away but has now returned remember, this too is normal. Often, children will refuse to eat a number of foods or develop unusual preferences such as wanting only red foods but rejecting anything orange or refusing any food that is runny and not solid. Try to get them used to the idea of at least trying new foods so that when the independence at all costs phase passes they will have developed a taste for a variety of foods across food groups. Start small, really small. Start with a tiny portion so as not to overwhelm your child. Try one pea, half a noodle or a small crumble of cheese. Encourage your child by telling them they will be done in a second. Follow the new food with a food you know they like. Increase the amount slowly at subsequent meals. Once they are eating a small but acceptable portion, phase out the follow-up food. The polite one-bite rule: This rule says that even if the child doesn’t want to eat a certain food they must take at least one bite of it before they can refuse to eat the rest. The best way to use this rule is as it’s stated. The goal is not to get them to start eating a new food now. It is to get them used to the taste of a food so that eventually they will be willing to eat it. When using this rule, make sure there is something on their plate that they will like. If they get frustrated by being required to taste several foods they don’t want to eat without there being something they do like, they may have a meltdown and simply refuse to taste anything. It will often take 10 to 15 tries before a child will accept a new food so keep having them taste a food even if they continue to insist they don’t like it. Give your child some control over the menu by offering choices. Don’t ask, “Do you want broccoli tonight?” They will simply say no. Instead ask, “Would you like broccoli or green beans tonight?” You can also set up a make-your-own night such as make your own tacos or stuffed potato and set out a number of choices to add. Invite over a friend who is a good eater. Often the ones who influence your child the most are their peers. Sometimes it’s enough for them to see another child grab a piece of broccoli and gobble it down for your child to decide they will also. Cook in ways that dampen foods bitterness. We are programmed to prefer sweet foods to bitter ones, perhaps because many bitter foods are toxic while sweet foods aren’t. Some children are genetically programmed to dislike bitter foods more than others. Children also have more taste buds than adults so they foods taste stronger to them. Roast vegetables which bring out their natural sweetness. A little lemon juice or zest will also help as sour counteracts bitter. Try switching the way foods are prepared. 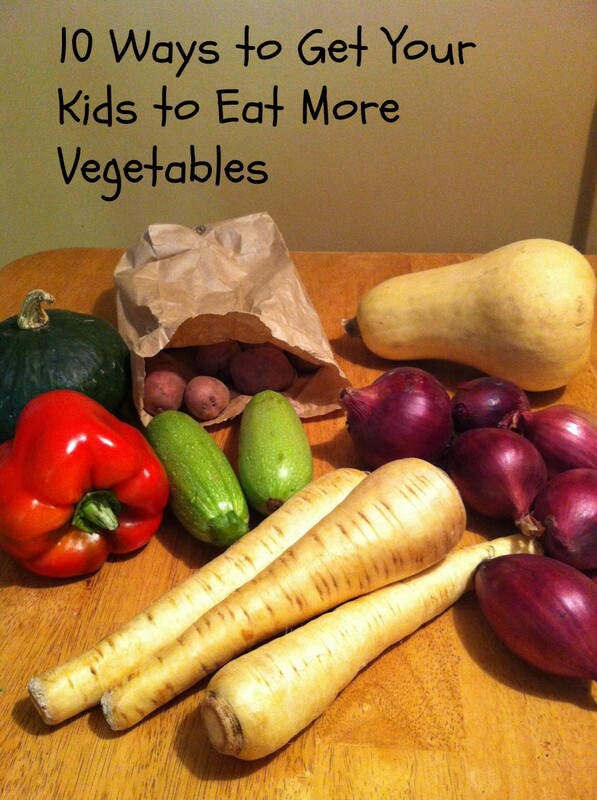 Serve raw those vegetables your child dislikes cooked and vice versa. Some kids can’t stand cooked peas or beans but will eat frozen ones right out of the bag. The problem may be the food's temperature or texture so changing the way they are cooked or if they are cooked at all can sometimes help. Let your child dip their vegetables and fruits if they won’t eat them. 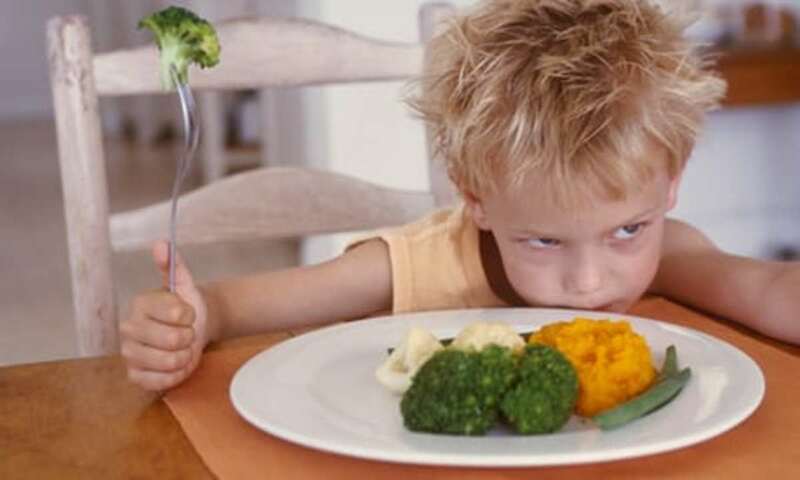 Even when you prepare vegetables in a manner to enhance their sweetness and minimize their bitterness, children may still refuse to eat them. Although most children are more likely to eat fruit than vegetables because they are generally sweeter, some kids refuse fruits as well. One way to encourage them to eat fruits and vegetables is to take three or four medicine cups and improvise a dipping bar. Put a small amount of three or four different dips in each of the cups. Children love to dip their food. Ketchup is usually the go-to dip that most children like. It is also a sweeter dip so it further decreases any bitterness the vegetables may have retained. You can put out peanut butter for apples and celery, hummus for carrots and green peppers, and low fat ranch or any other salad dressing for any vegetable. If you don’t have more than one or two possibilities, improvise as you would with a salad. Mix together a small amount of oil, vinegar, mustard and seasoning for a quick vinaigrette. Thin a spoon or so of cream cheese with water, microwaving it for a few seconds to make it soft enough to stir. Other types of cheese can similarly be made into a fondue dip. You can get your kids to eat something they may prefer to leave by getting them excited over dessert. Give them sliced apples with a little caramel sauce to dip them in or cut a banana in half, insert a popsicle stick in the flat end and freeze. Let thaw for a few minutes and give them their “banana pop,” with some chocolate sauce to dip it in. Studies show you won’t have to let them dip their fruits and vegetables forever. Children usually are willing to eat at least a small amount of vegetables and a regular serving of fruit after they have eaten it several times. If you are afraid you will be teaching your children to eat vegetables only when smothered in some kind of dip, don’t worry. A study showed that children given brussels sprouts with some cream cheese like them better than children who ate them plain. The interesting part of the study is that those who were given the vegetable with the cheese seven times they were willing to eat the brussel sprouts plain and liked them. The kids never given the cream cheese for their vegetable still were not willing to eat the sprouts even after they had tasted them ten times. When all else fails with fruits and vegetables, try the sneaky approach. 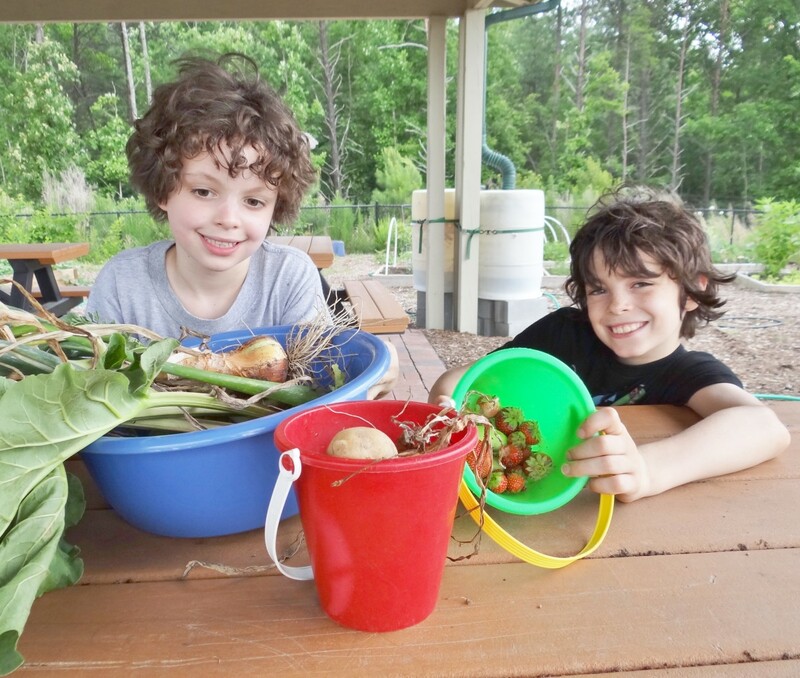 This approach addresses children who refuse most vegetables or even all vegetables due to oppositional defiant behavior or a strong personality coupled with the desire for independence. Sometimes the best way to deal with arguments over food is to prevent them from starting in the first place. If you ask your child if they want to wear the white shirt or the blue one and they reply, “No,” especially if this tends to be their reply to everything, this may be a good strategy to try. Puree and grate fruit and vegetables into whatever you can. This is a great option for soups, stews, casseroles and baked items. Put them under the cheese on a pizza or disguise them in layers of lasagna. Carrots, zucchini, spinach broccoli, cauliflower and applesauce and pear puree are all great choices. These options add a bit of flavor and lots of nutrients, and your kids will never know. Hiding the nutritious foods in other preferred foods won’t teach them to try new foods. However, if you fear your child is missing out on important vitamins and mineral on a regular basis which is making your anxious this technique can help both you and your child. Take a look at the chart at Choose My Plate to see how much of each food group your child should be getting. Let your child help prepare snacks and meals. Studies have shown that children who are picky eaters are more likely to eat something they helped make compared with something served to them. There are numerous child-friendly meal and snack recipes you can find that will turn a miserable mealtime into family fun. Roll-ups are a fun favorite for kids to make and they can be filled with almost anything. Peanut butter and jelly, chopped chicken, avocado and salsa, roasted or sauteed rainbow colored vegetables covered with cheese and melted, tuna or egg salad with shredded lettuce, chopped tomato, and green peppers, or shredded beef with sauteed onion, green peppers and mushrooms. You can use tortillas or even regular bread that is fresh enough to roll to a quarter inch thick. Let your child spoon on the filling and roll it up. For dessert, chop some different fruits and let your child sprinkle with a little cinnamon and drizzle some chocolate sauce or another favorite over the fruit before they roll it. This may become one of your go-to strategies when it is clear your child is refusing food even before meal time. Use reinforcement. This technique is very effective with children who are refusing to eat certain things because they are being oppositional, want to control the situation or are in a stage where independence has become a priority. Most parents are familiar with the technique of giving the child something they want after they eat and many don’t like using it. Some feel you shouldn’t have to basically pay children to eat what they are should. Yet children aren’t born knowing automatically how to behave. When eating problems are part of a larger problem with defiance, behavioral techniques such as reinforcement have been shown to be effective. Try a token economy with response cost. To do this let your child earn tokens for specified eating. For example, they can earn a token if they eat all of one item on their plate, (ensure this happens with a food you know they will eat so they can definitely earn this token), for taking a bite of a new food they don’t want to try, for taking a bit of two other foods they have tried before and didn’t hate and whatever other types of behaviors you want to increase. Set up a schedule of rewards with an associated number of tokens it will take to “buy” the reward. Small rewards such as half an hour on the computer or one t.v. episode, can be used for a single day’s meals and snacks. Larger rewards can be used for a week during which they earned a certain number of reinforcers as a bonus. 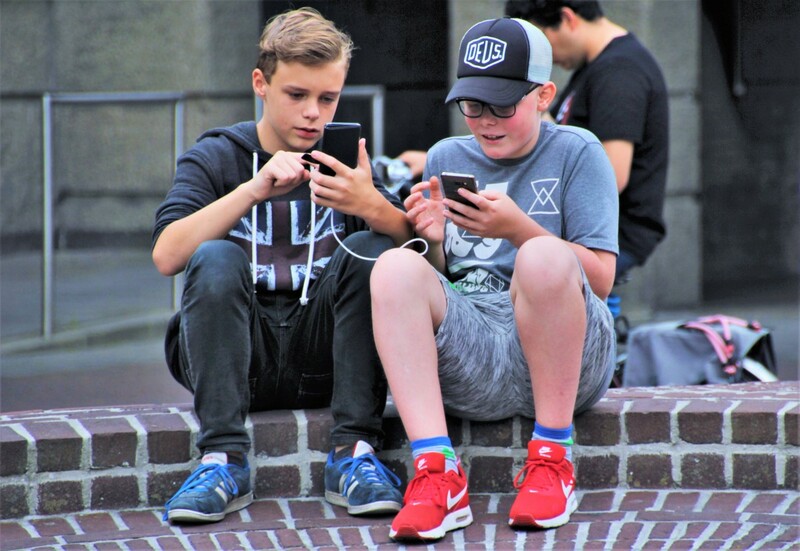 For younger children, use both daily rewards then even though they’ve used the tokens use the total they earned that week as the tally for they weekly bonus reward. Offer extra tokens if they eat more than they are expected to so they will feel they have some added control over what they earn. For example, let them earn an extra token if they take two bites of the foods they are supposed to taste instead of one. Combine response cost with a token economy. There are a number of parents who balk at this idea. They feel that using this type of strategy makes eating a negative experience and to some degree they are correct. Yet sometimes your picky eater’s behavior may be part of a bigger problem they have complying with your instructions. When you have tried everything else, this may be an effective last option. If the token economy doesn’t appear to be as effective as you would like, take a token away each time they fail to carry out one of the desired behaviors. Make sure you set the contingency up so that they earn more than they lose and don’t let them drop down to zero or reach a negative balance. This will make it seem impossible to earn anything worthwhile since they don’t see how they can accumulate enough tokens to redeem for something they want. Most importantly, make food fun. Cut your child’s food into fun shapes with cookie cutters. Use foods to create pictures such as faces. Encourage your child to invent new snacks they like. Have them come up with different tastes with homemade low-fat dressings or dips. Let your child name the foods they help create or suggest they it is named after them. For example, dishes might be named Joshua’s Silly Salad, or Maria’s Pasta Marinara. Make a big deal out of serving them to the whole family. Ranch dressing is a favorite dip for all kinds of vegetables. Eating Well has this recipe for homemade ranch dressing that’s easy and healthy. Cooking Light provides 12 hands-on recipes your toddler can help you make that are fun and delicious. The Picky Eaters Project provides family-friendly recipes that even the fussiest eater will try. Babble gives a list of 50 great child-friendly recipes to encourage picky eaters at meal times. It can be very frustrating when your child is a picky eater, refusing foods based on their color or texture or only eating a particular type of food. Don’t be concerned, however, if your child is a picky eater. Being picky about food and food refusal is a normal part of development for many children between the ages of one and six years. Remember that your child’s picky eating is temporary. As long as you don’t make it a big deal, it will usually end before the time they enter school. Providing your child has enough energy to do everything they need and want to during the day and they are growing normally, they are likely eating enough to stay healthy. If you do have concerns about your child’s eating behavior, nutritional intake or growth be sure to talk to your child’s physician. They can fully evaluate what is going on with your child around meal times and determine the best course of action while putting your mind at ease. Brawley, L., & Henk, J. (2014). Encouraging healthy eating behaviors in toddlers. Join us in New Orleans for These Exciting Professional Development Opportunities. Ong, C., Phuah, K. Y., Salazar, E., & How, C. H. (2014). Managing the ‘picky eater’dilemma. Singapore medical journal, 55(4), 184. Taylor, C. M., Northstone, K., Wernimont, S. M., & Emmett, P. M. (2016). Macro-and micronutrient intakes in picky eaters: a cause for concern?–3. The American journal of clinical nutrition, 104(6), 1647-1656. It is a really big problem form many families and there are also the emotional effects on parents with feelings of guilt, anger, frustration, and a lack of efficacy in parenting that can tie into it. Thanks for the reply. No problem. I figured I would share since we had such a struggle. Hopefully, it helps out some the other parents out there with the same issue. Thanks for the info and resource, Papofpickyeater. I appreciate the addition. I guess you could say that the end justifies the means. Sometimes we do what we have to do. I led an encopresis clinic on internships and we routinely told parents to hide fiber under the cheese in pizza and to mix it is with other favorite foods. The kids knew they were getting fiber somewhere but since they didn't taste it they didn't care. Cheers. I wasn't quite sure how child psychologists would view the 'deception' technique my husband used. Liz, Your husband deserves an award! Picky eaters are difficult to convince at best. Not only were there no fits he managed carrots? Fantastic! Thanks for stopping by and for the comment. There are some great tips in here. My husband once got our son (now grown-up) to eat carrots, by calling them 'tarrots'. He renamed lasagne as a stew with the same effect. I wasn't around at the time, but he was quite pleased with his success in tempting a reluctant eater! Very thought-provoking ideas. Even now, when feeding my adult grandchildren, I tend to hide extra vegetables in the meals I prepare for them. They think my curries are sometimes a bit strange, compared with the ones they get from the local takeaway restaurants, because I always pop in a few carrots, peas, courgettes and other greens, along with the chicken or fish. They laugh at me, but I notice that they still eat it (and enjoy it), so I must be doing something right. Thankfully I never had to deal with this with my daughter. She ate anything I gave her. However, my sister dealt with it with all three of her boys, including vomiting, weight loss and growth issues. One has rules about no butter on toast and will only eat certain things like noodles and dry salad even though he’s now almost a teen.